NFPA 285 offers the insight and testing criteria to accurately determine flammability characteristics of exterior wall assemblies to help ensure adequate fire resistance. NFPA 285, Standard Fire Test Method for Evaluation of Fire Propagation Characteristics of Exterior Wall Assemblies Containing Combustible Components, provides a method of measuring flame spread resistant properties of external construction materials when exposed to interior fires that reach flashover, break outside windows, and reveal the building facade. 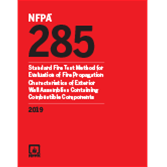 An essential standard for testing laboratories and manufacturers, NFPA 285 covers details of test specimens including new types of wall systems and materials, testing documentation and instrumentation, and the latest requirements, criteria, and diagrams for thermocouple locations. Make informed decisions to help improve fire protection with NFPA 285. Interested in other editions of NFPA 285? Use the drop down menu above to select the edition year you need. 5.1 Location of Test Specimens. 5.3 Size of Test Specimen. 5.4 Position of Test Specimen. 5.6 Securing Test Specimen to Test Apparatus. 5.7 Construction Details of Test Specimen. 9.5 Determination of Extent and Depth of Damage. Make informed fire protection decisions based on accurate determination of how effectively exterior wall assemblies can resist flame propagation by using testing criteria in the 2012 NFPA 285. NFPA 285, Standard Fire Test Method for Evaluation of Fire Propagation Characteristics of Exterior Non-Load-Bearing Wall Assemblies Containing Combustible Components provides a method of assessing the flammability characteristics of exterior, non-load bearing wall assemblies and panels which are required to be of non-combustible construction but may contain combustible components. The Standard addresses fire exposures from interior fires that reach flashover, break exterior windows, and expose the building facade.